Rossvale maintained their unbeaten league record this season at Huntershill with a narrow 1-0 victory over bottom-of-the-table Larkhall Thistle. Gary McGrath got the only goal against a much improved Larkhall in the 40th minute in what was a very disappointing performance from the promotion challengers. Larkhall who got the first shot in on goals in the 13th minute when a header went narrowly over. Two minutes later Vale showed one of their rare glimpses of brilliance when McGrath found Anton McDowell who laid on excellent wide pass to Andy Johnstone. 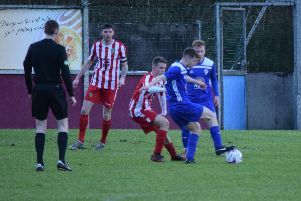 From his cross Liam McGonigle outjumped the defence and headed into the empty net but the referee judged that he impeded a Larkhall defender in doing so and ruled the 'goal' out. On the half hour Johnstone won a ball inside his own half and made a deep run into the Larkhall area before finding Gary Giffin whose shot sneaked narrowly past. Two minutes later man of the match McGrath who set Giffin off on a run but when his cross found McGonigle his final shot also sneaked past. But McGrath was on the receiving end in the next attack and he made no mistake when he buried the ball past McGraw. Just on half-time Vale nearly got another when a McGonigle corner found Kirk Forbes and he passed to Giffin who couldn’t believe it when his shot crashed off the bar. The second half performance was just as poor as the first with attacks breaking down and passes going astray. 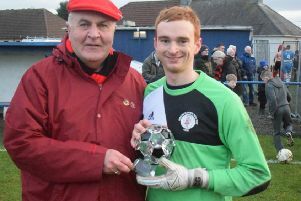 Larkhall who were possibly the better team late on in the game when they found a new confidence and only two brilliant saves from Jamie Donnelly saved Vale from a shock defeat. The only highlight for Vale in the second half was late on when Johnstone won the ball in the Larkhall half and found Jamie Hunter going down the overlap and his cross to the back post was just narrowly put past by a diving Chris Zok. This Saturday Vale play their final game of the year when they make the short trip to the James McGrory Park to face local rivals St Roch's.